We'd reserved a five p.m. table for tea at The Ritz, thinking it would be a perfect prelude to the London performance of Andrew Lloyd Webber's musical, Whistle Down the Wind. What we experienced, however, was a ritual of elegance and grandeur that could stand its own against any theatrical performance. 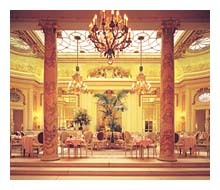 Served in the Palm Court, Afternoon Tea at the Ritz has become an institution since the hotel opened in 1906. King Edward VII, Charlie Chaplin, Churchill, De Gaulle, Noel Coward, Judy Garland and Evelyn Waugh were frequently seen in The Palm Court, as were many members of royalty, aristocracy, heads of state and stars from stage and screen. In recent years, the Ritz has been fashionable with celebrities like Julia Roberts, Johnny Depp and Hugh Grant. As we made our way to a "center stage" table, ushered by our waiter, Robert, we noted that there were no film celebrities on this particular afternoon - so we decided to play the parts ourselves. This was easy to accomplish, as the staff makes everyone feel like stars. Their noble manner and eagerness to please reflects the finest of English tradition. The environment, in and of itself, is an experience. Perfectly located in the center of London, overlooking the Royal gardens of Green Park, with views to Hyde Park Corner and Knightsbridge on one side and Piccadilly Circus on the other, the Ritz opened its doors on Thursday, 24th May, 1906. Famous hotelier César Ritz had taken pains to ensure that every detail of the architecture, both inside and out, were to perfection. This flawlessness has been the trademark of the Ritz for 94 years. A long gallery, with a high-vaulted ceiling, runs that length of the hotel, from the entrance to the restaurant. Halfway along, to the left, is the Palm Court, where we sat eagerly awaiting the tea ritual to begin. Apart from its gilded trellis and widely spaced marble columns framed by archways and deep steps, the Palm Court's true charm lies in the use of curves, rounded ends, oval oeil-de-boeuf windows and a deep cornices. Behind us, at the rear of the room in a central niche, was a sculptured female figure in gilded lead, and on either side, mirrors from floor to ceiling which enhance and enlarge the area. To complement the surroundings, our tea was served on fine bone china with an exclusive Palm Court design that features the gold, pale green and rose colors to perfectly balance the light and charm of the room. The tea comes in silver teapots, with matching cream containers and tea strainers. Traditional English tea is offered together with China Oolong, Lapsang Souchong, Earl Gray, Ceylon Orange Pekoe, Darjeeling and Jasmine tea. Robert also brings a selection of freshly cut sandwiches, including smoked salmon, cucumber, egg mayonnaise with mustard and cress, turkey and mayonnaise and cream cheese with grain mustard. To complement the finger sandwiches which are served on the base of a three tier silver stand, we were offered a middle tier of freshly baked scones with jam and clotted Cornish cream, and a top tier selection of afternoon pastries, all of which were superb. Whether taking a break after shopping, substituting lunch or just meeting with friends, Afternoon Tea at the Ritz remains a focal point of the day for many people. Tables can be reserved at 3:30 p.m. and 5 p.m. While reservations are highly recommended, an unreserved sitting is available at 2 p.m. Bookings for weekly tea should be made two-to-four-weeks in advance, while weekend reservations should be booked two months ahead. The direct reservation line is (44) 0171.493.8181. One can also make reservations online. 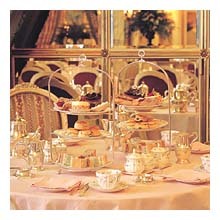 The Ritz has established an Afternoon Tea web page. This web page provides a traditional menu, and reservation form. E-mail requests may also be made through enquire@theritzhotel.co.uk. Read more on High tea.